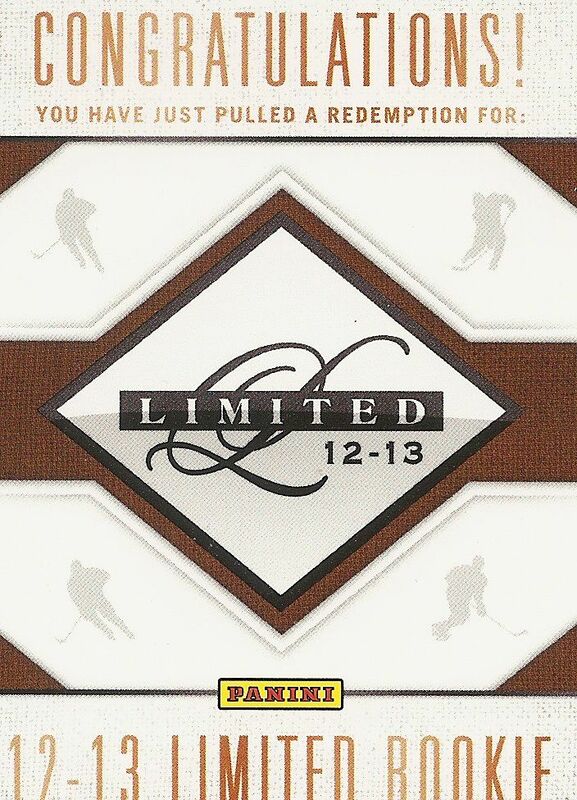 Limited... what an appropriate name for a card brand, as there will certainly be only a limited amount of products for hockey collectors to buy this season! Hopefully though, with less product will be better concentrations of value. Panini's Limited brand of cards has always given collectors a very concentrated amount of cards for its price point. Let's see what kind of value it yields as I rip into a box! 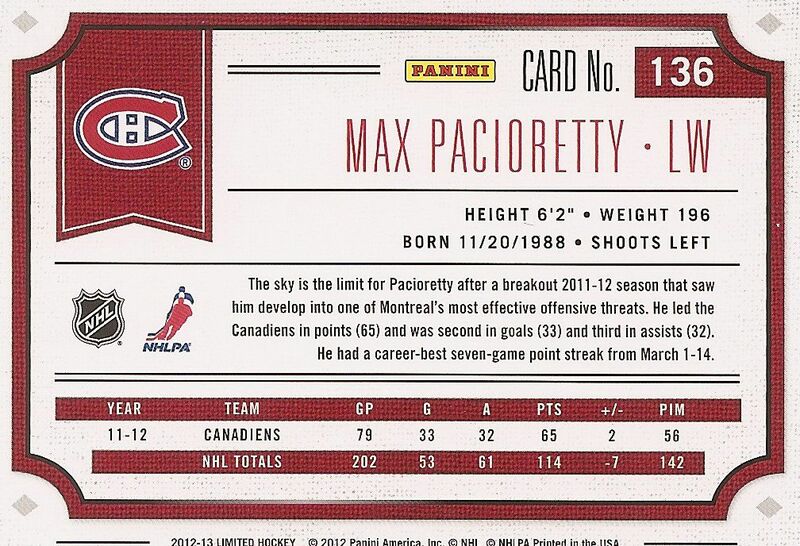 I have to say that I appreciate Panini's approach to Limited Hockey. It has a very different feel to it compared with their basketball and football Limited releases. With the other sports, there is a focus on foil and shine in the base set. 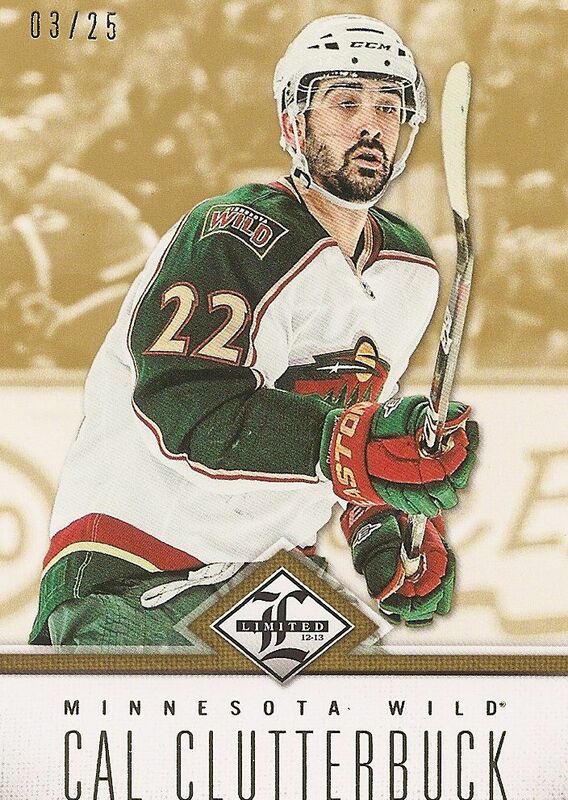 Here with hockey, the base cards are more subtle... they are more refined and understated. The cards are sweet and mature. Panini has gone away from the paper thin foil card stock and have instead gone with a thicker base card. The image of the player on the front of the card has an art effect on it that makes each card look as if it were drawn rather than shot with a camera. This effect softens up the card in a way that really makes these base cards look classy. Furthermore, the subtle foil accents and minimalist graphic design of the card only increase the amount of class these cards have. There are no gimmicks here, just clean, beautiful cards that look and feel premium. Like every card in the product, these feature serial numbering. Standard base cards are limited to only 299 copies. The back of the Limited cards have a horizontal orientation - certainly an interesting choice given that the cards are vertical on the front. It works though, and works well. Just like the front, everything about the back screams clean and classy. There isn't any wasted space, and though there is not player image, the back looks good enough that it doesn't need one. The little banner with the team logo is a great little design element, as is the frame that borders all the pertinent information about the player. There is only enough room for one line of statistics, but this is pretty much the standard for higher-end cards. As usual, the manufactured patch rookie cards are again part of the Limited base set. These cards have always gotten a mixed reception with collectors. I, for one, am not a huge fan of any manufactured pieces except for country flags. So I'm in the camp of collectors that would prefer Panini to change it up with their Phenoms rookie cards. The box that I opened at D&P Sports Cards was a redemption, but if you have seen the Phenom manufactured patch cards, they look very similar in nature to ones produced in other years. The athletes sign a white piece of cloth with some sort of manufactured logo on it. These aren't terrible cards by any means, but I think collectors are ready for a move in a different direction. With Limited being a higher-end card release, I am sure that collectors expect (want) to have some sort of player-worn material for their rookie card pulls over these. The great thing about Limited is that collectors can tell a lot of thought went into creating the cards in the product. There are a myriad of different inserts, game-used, and autographed cards to find in boxes of Limited. Shown here is one of those cards that has definitely been given much thought into creating - a Limited Duels acetate insert card. This insert card has a lot going for it - it's made of a special material (AND has foil), has serial numbering, and can be combined with another card to create a larger one. When I think about how insert cards should be, this is what I think the standard is. It's great that the Limited inserts have been designed creatively. Insert cards have definitely fallen in terms of quality since their heyday in the 90's, but that doesn't mean companies should just put out lame, stale 'throw away' cards. It's awesome that there are inserts like these that cause collectors to stop and think: 'Wow, this is a neat card that I have here!' Really great job by Panini with these. Collectors can find these and other smartly crafted acetate cards in Limited this year. 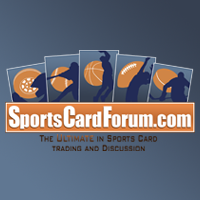 Because of the NHL lockout, the powers that be decided that there will be no rookie cards of new players this year - only holdovers from the last season. That's a real bummer for collectors, but to alleviate the bad situation a little, Panini has inserted redemption cards for new players that are skating for the first time this year. These cards will be released (most likely) after the season, and give collectors a chance at having a nice card waiting for them later. Panini did this last year when the NBA's lockout derailed the basketball rookie class that year. These cards are definitely delayed gratification cards, but it's a nice gesture by Panini to try and get collectors cards of the best new players from this 12/13 hockey season. The cards do not state what players collectors will get, but they do state the team - these are similar to Upper Deck Artifacts rookie redemption cards. Panini has stated that their intent is to pick the very best of the new skaters and include them in the redemption checklist. New this year in Limited are the Limited Travels cards. These cards document a player's movement between teams and highlights that movement with game-used material from their different teams' jerseys. It's a fun idea to incorporate material worn by the player while with different teams. I'm sure many player collectors will find these cards a unique and fun addition to their collections. I actually really appreciate what Panini has done here as I'm sure they have tried to get the appropriate material imbedded in the card. So often collectors find material in game-used cards that are mismatched with the photo used on the card. Here, it is imperative that Panini puts the right pieces in the right place. Though this card concept is certainly unique, I cannot say it is completely new as I have seen other companies (namely ITG recently) do this in their releases. Back this year with a different look are the Jumbo Material cards. I remember pulling the black-background-horizontally oriented cards last year and liking them... this year I still like them... but these are now on a white background and are vertically oriented. I'm sure the designers at Panini wanted to change the cards up a little, but it's funny how these cards are pretty much the exact and direct opposite of their counterparts from last year. Like I said earlier, Limited has a ton of things to find in it - beautiful things. 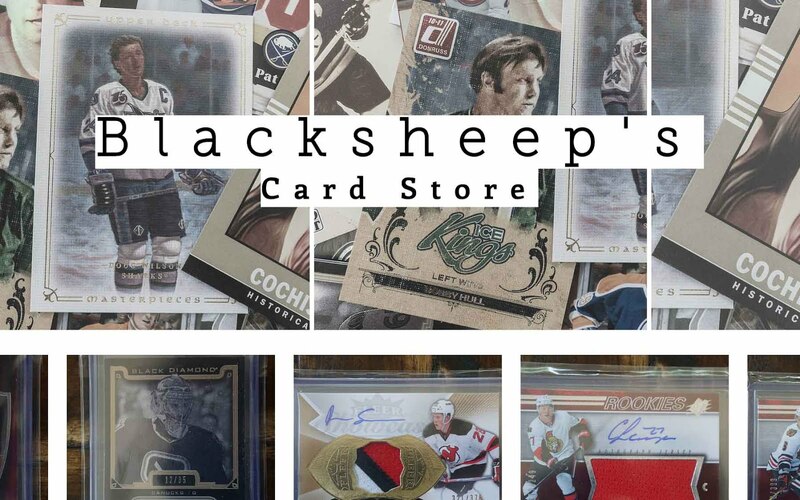 Collectors can look for gold parallels to 25... other parallels, puck pieces, on-card autographs of trophy winners and Cup champions, net pieces, patches, and even the entire Reebok logo from a jersey. There's just a ton of great looking cards to be found. Of course, the best will be tougher to find than the rest. Check out video breaks of the product and I'm sure you'll be impressed by some of the content you'll see. Though Limited has a ton of amazing things to find in it... it is a product that does not give its best cards out easily. Often times collectors will find, like I did, a few jersey cards and an autographed rookie manufactured patch card - cards that are not of great value for the $100 price point of a box. To really find the spectacular hits, collectors need to purchase Limited by the case... or by cases. Otherwise, the risk is a bit too high. I like to think about it this way... when looking for case hits, I like to think about the number of boxes per case. In Limited's case, it's 15. That's A LOT of little Limited boxes! Finding the one or two boxes with the big hit is a pretty tough proposition. At least with the mid-end or lower end products, not getting a case-hit will yield a bunch of cards. In Limited, there are only seven cards per pack. Though they are beautiful cards, it's just not a lot of cards! So overall, I'd have to say that Limited is a product you have to really think about carefully when buying at the box level. 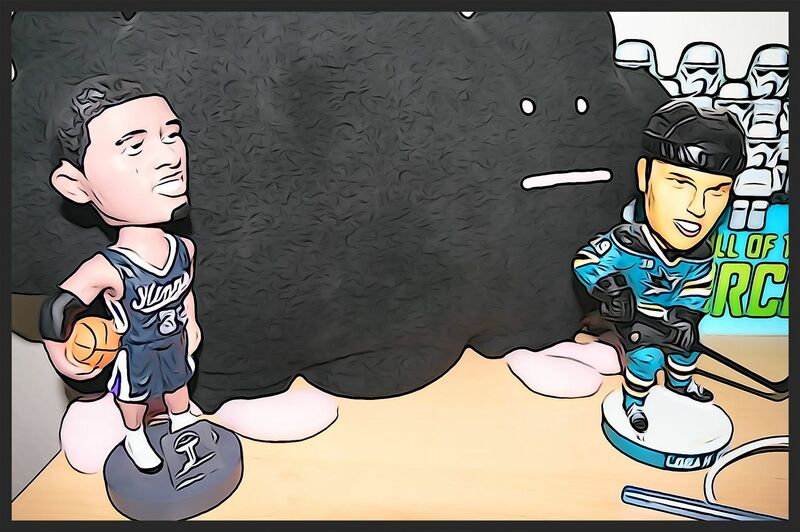 You have to realize that the risk of getting some jerseys and a random rookie are pretty high. For me, I love to try everything, and I love taking risks on stuff like this... but it's definitely not for everyone. It's probably a smarter idea to simply find the singles of Limited you want after the big boy collectors bust it open and put their pulls on eBay. But of course, the ultimate decision is with you! I personally like Limited and the way it looks. I'm definitely intrigued by what can come out of a box. But this year I think I'll be looking more for Limited singles rather than cracking a bunch of boxes. Let me know what you'll be doing with this new release from Panini! Nice Sakic! 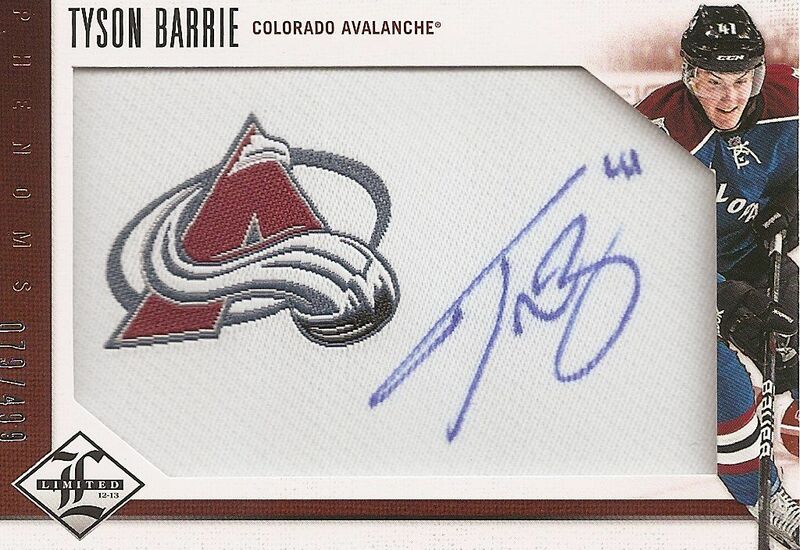 Too bad they shorted the amount of rookies this year, but i saw chris open your box and pulled a tyson barrie phenoms auto. I really like this product this year, I even like the base card. I like the colour tone on them. 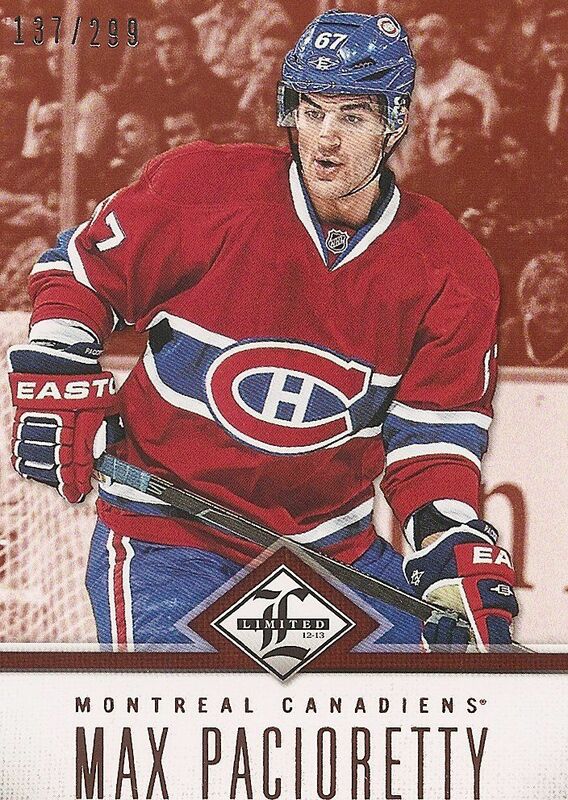 With the red shade on the Habs card. 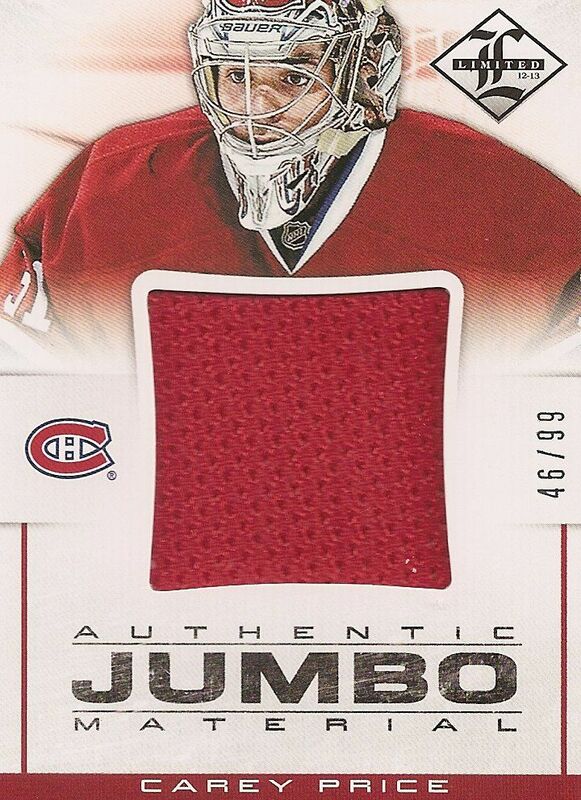 Jersey cards are usualy blah but these ones are great, I like the fact that the basic Jersey cards are jumbos. 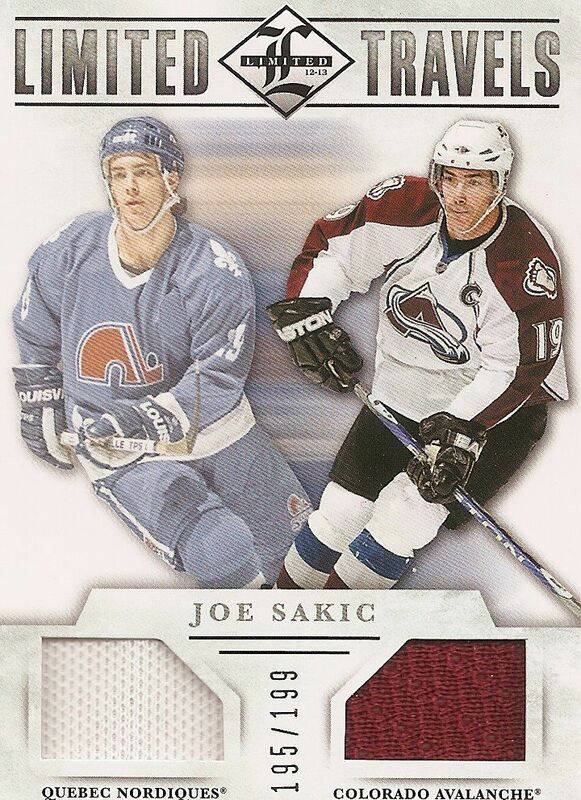 Love the Sakic card as well that is a nice pull. All around I cannot find any negatives for this product this year, other than the price of course. Only because the rookie class is so poor. The product has really improved. It pretty much has an extra hit this year. The variety in hits is great. I really like it a lot! The design is nice too! I really like that you can get some AMAZING relics from limited. Style, and Grace too. Love the thicker base cards for this product, plus the common jerseys being jumbo makes me like this product a lot. Product looks really nice this year, really like the Sakic! Too bad you had to get basically 3 redemptions in 1 box...anyways, great review as always! Last year's Limited was very "Black" in terms of colouration and design. I see this year they went with white to change it up. While I like the black, the white fits very well with hockey and the new cards added into Limited (Travels, Duels, etc), it's great to see something new within older products, and not just the same old thing with a new design. Pretty nice product, although not sure if I would pay for it. I really liked the base look and how it is on thicker stock. 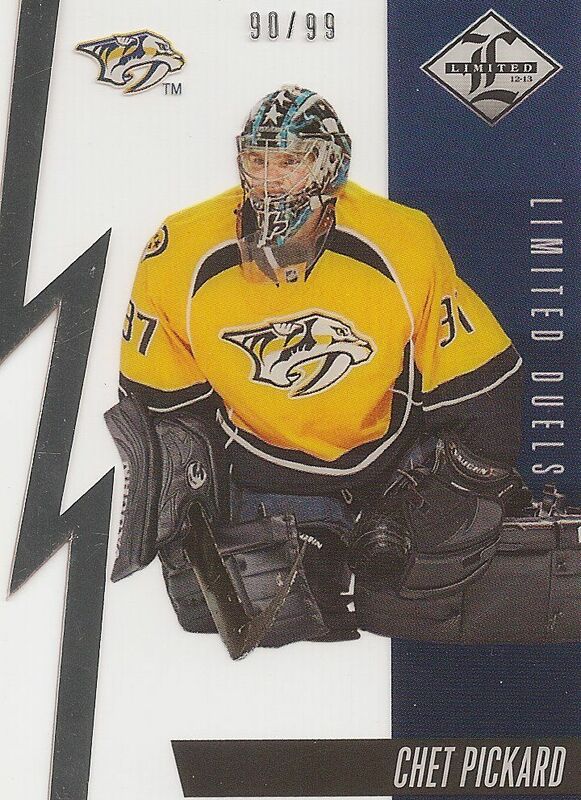 I also really liked the chet pickard card. I enjoy it when cards do something original. I think that panini limited is relay nice product this year! The hits are pretty good! I'm a big boy, I'll buy a box, but not post it on youtube like i do b/c my g/f will see, hah! I'll post the photobucket link on your facebook page. I'm in no rush to buy this product though. I'm liking the creativity of the against the glass die cuts #/25, as well as the inclusion of the mini nets from the all star super skills on cards. The veteran player manufactured patch autos are a step up from the sticker-autos from last year. Wish Canada was the same price as U.S. Damn, oh well. Panini Limited looks like a step up from last years product and it does look like a hard set to put together plus theirs so many parallels! Looks great actually but i still hate that they have so many redemptions and sticker autos on the cards ive seen. grteat product.price is steep but i am willing to take a chance. great product. I love those cards were it has 1 player on a team then it shows the same player on a different team. Limited looks pretty good this year, I have always liked the Limited product, good bang for the buck(usually). Cool! My favorite card is probably that sakic. Most collectors will appreciate that they made sure the different jerseys got put I the right slots or just the extra effort panini put into making these cards. Pros: New thicker base cards, non-foily base cards which I prefer. Cons: Redemption heavy, weak rooking crop (intangible). Overall I love the improvement in design regarding the base. I would take Limited over Ultimate but still would be hard pressed to buy a box. Thx as always for the contest. Limited seems like a quality product this year. I love the limited travels cards! I think this is very creative. I also like the jumbo material cards! Nice Review! good review. the design has improved each year. Although the value has seemed to lack each year. This year's effort is by far the best of the three with a good mix of inserts, vets, etc. I really like the jumbo jerseys this year! Overall I think it was a good product! Thanks again for all the contests! Don't think my fist post went up. I apologize if it did. I really like the look of Limited this year. Even though we haven't seen too many 12-13 products, this seems to be the best so far. I love those limited travels cards. I think it's cool how you can actually know what team he was playing for when he wore that jersey. I'm not a fan of the acetate dual cards. Don't get me wrong, they look very nice but I'm not a big fan of having to combine 2 cards together to complete it. Everything else looks great. While I liked the base design a little more last year, I still think this year's looks great. Considering how we won't have a big rookie crop, this product is perfect. It's not relying on rookies such as Series 1 and it's still of current players, unlike Classics. Classics is a nice product but I think this would be better for a collector like me. i'd rather pull a card of a player that's still playing. The best cards in this set is probably the Stanley Cup Signatures. They look awesome! I also like how they added the rookie redemptions. I haven't busted anything open since the lockout began. This product might change that. Another great Panini product! I'm not a huge fan of limited, too expensive. A hugggeeee improvement over last year!!!!! I think Limited is much better than last years, there are many nice cards to pull and nice autograph cards of established players. The base cards look great, probably the best so far this season along with series 1 (which always is a personal favourite). I like the thicker stock they've used, and the redesign for the jumbos, but not much else. Though I'd be interested to see where the auto goes on the Jumbo Jersey Auto cards. Limited Travels is a cool concept but those cards look almost exactly like Rookie Rivalries from Rookie Anthology. Acetate card design doesn't look very well though out. I did my dough on Limited last year, and while I pulled some nice cards, you really had to hit something big to get a return on investment as there were plenty of average boxes. Think I'll pass this year and pick up singles as I come across them. Hi Luke. Great review. Been reading your site for a while and thoroughly enjoying it. I was a local card shop today and found a Logan Couture you may be interested in. According to your Photobucket you already have one, but let me know if you'd be interested in trading for a 11/12 Artifacts Couture Emerald /99. If so, shoot me an email at carsten_ccc@yahoo.ca and I'm sure we can work something out. thanks for reading! i do not need another one of those emerald couture cards, but thanks for keeping an eye out for me! I really like limited this year. I think it's cool that they decided to do the rookie redemptions. Also with insert acetate cards it makes it a unique product! Great product! Very nice inserts and jerseys. Not a big fan of the Phenoms, but great product overall. I like the look of the base cards this year as well as the Rookie Cards. As always thanks for the review. Amazed at how many posters like this product. To me it's just more valueless overpriced trash from Panini. Their products are all turning into a repetitive mash of uninteresting design and third stringer hits. Pass. Not a bad product this year, but I don't really think they improved it as much as I thought they would. The base design and the Limited Duels are very nice! I think Panini should work on the design for the manufactured patch rookie autos, its getting repetitive and I can't seem to tell the difference between this year's and last year's. The Trophy Winners parallel/auto is my favourite set. Overall, I think Limited is pretty average, as it is a hit/miss product. last year i loved limited i bought so many cards from limited! this year i dont know im not a huge fan of the overall design i still kinda like it but im not gonna be buying that much of it... Thanks for the contest! Pulled a Tuukka Rask 1 of 1 Manufacture's Mark from my first pack bought.....needless to say I was very happy!